The UK's Overseas Territories and Crown Dependencies have been told to improve standards of regulation, and find new methods of raising tax. A government-commissioned report suggests changes offshore centres need make to meet international standards. The UK wants to reduce the amount of tax revenue still going overseas. 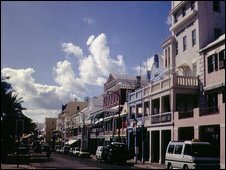 The Overseas Territories reviewed include the Cayman Islands, Bermuda and the British Virgin Islands. They also include Jersey and Guernsey. Michael Foot, the report's author, said that several jurisdictions had "a good story to tell, but others had more to do on regulation and tackling financial crime". The role of offshore centres came into focus after last year's financial crisis. Leaders of the G20 group of leading economies have made repeated calls for action to curtail business in "tax havens", and close "loopholes". At a time of great strain on public finances, the UK government is worried that valuable sources of tax revenue are still being channelled overseas. Officials believe that, after years of leniency, the prevailing wind is now blowing against the offshore havens. "This report sends a strong signal that overseas financial centres must ensure they have the correct supervision and regulation," said financial secretary to the Treasury Stephen Timms. Guernsey's Chief Minister, Deputy Lyndon Trott said: "This vindicates the position of Guernsey and the other Crown Dependencies." Guernsey believes it has set the standards that others should now follow. Officials say there will be a combination of "carrots and sticks" to encourage all the offshore centres to come into line. If they do not by March 2010, the G20 could impose a range of economic sanctions. The global recession has hit some of the island economies hard, and many now face serious problems balancing their budgets. In his report, Mr Foot encourages them to find ways of diversifying their tax bases. He does not specify the action that should be taken in every case, but it could include raising significant extra revenue through income tax or corporation tax. The British Overseas Territories and Crown Dependencies have sovereignty over their own tax affairs. Many will fiercely defend their reputation as low-tax economies. Short of sanctions, there is little the British Government can do directly to end tax evasion overseas. But UK officials think sustained international pressure has already brought significant progress. It has always been extremely difficult to estimate how much tax is lost when companies or individuals move offshore. The UK Treasury would like to see greater transparency, in order to obtain a better idea of the "tax gap". One estimate provided in a separate study for the UK government by Deloitte is that the decision of companies to locate in British Overseas Territories and Crown Dependencies means that up to £2bn a year is lost in corporation tax. But Ronnie Ludwig, partner at accountants Saffery Champness, said money also flowed the other way. "In the second quarter of 2009 alone, the Crown Dependencies provided net financing to UK banks of about $333bn- a vital liquidity boost," he said. "There is also a lack of clarity in the Foot report on how different jurisdictions can be affected. "Specifically, the UK may not be able to impose changes in Guernsey or Jersey's tax regime without EU sanction as these jurisdictions have been granted tax havenship in perpetuity under the Treaty of Rome," he added.